Scandal's a funny thing for smartphones. Sometimes a _phone_ bounces right off a controversy without batting an eye – just look at how all the antennagates and bendgates failed to derail iPhone sales. Other times the impact is much more substantial, and it didn't take very long last year for us to go right from the first reports of Galaxy Note 7 battery issues to the _phone_ being recalled en masse and ultimately scrapped. 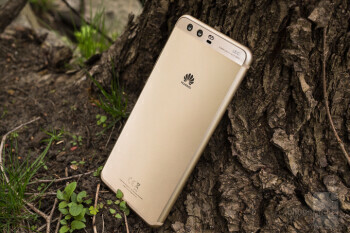 Huawei launched its spring flagships back at Mobile World Congress in February, introducing the duo of the Huawei P10 and P10 Plus. Initially, we put the smaller P10 through our review process, and found it to be a solid handset that improved in a few ways over the P9 (which we already liked) – it wasn't any great revelation of a smartphone, but its incremental upgrades didn't disappoint us, either. 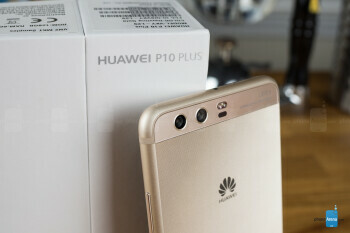 But in the weeks since reviewing the P10, we've been following reports concerning the components Huawei uses to build the phone, and it's come to light that not every P10 (and in the same light, P10 Plus) is built with the same top-quality parts. You might get a phone with speedy LPDDR4 RAM and UFS storage, or you might get stuck with slower LPDDR3 and eMMC 5.1 chips. 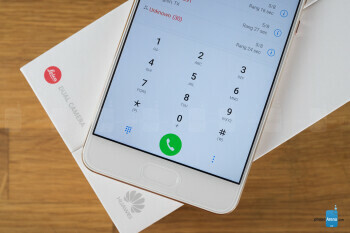 Huawei's tried to downplay the severity of the situation, claiming that the ultimate impact on phone performance is minimal, and arguing that its actions were necessary to avoid P10 shortages. That very well may be true, but now we find ourselves forced to put these phones under the microscope, looking much more closely into just what hardware shoppers are getting for their phone-buying dollar. 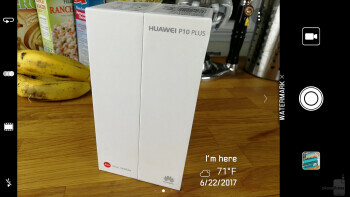 For a few weeks now, we've been carrying around the P10's big brother, the P10 Plus. With a bigger, higher-res screen, changes to its dual-camera system, and higher-end memory and storage options, the P10 Plus should be a real upgrade over its smaller sibling. Are all those enhancements worth the additional price of entry? And does the recent scandal over memory and storage taint those upgrades? Let's take a look. 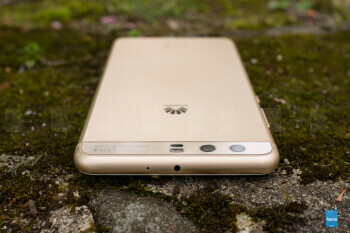 If that were the beginning and end of it, this wouldn't make for a very interesting review, but there are some salient points to be made about how Huawei grew out the P10 for the P10 Plus, and how that extra space goes to use. Somewhat surprisingly, despite being half a centimeter wider than the P10, and a little under a centimeter taller, the P10 Plus is exactly the same thickness as its sibling: 6.98mm. Just like the P10, the P10 Plus features a rounded-edge metal body with a decently thin profile. While the design itself doesn't feature much in the way of unusual or noteworthy elements, it's also one that's more than a little bit of an iPhone clone – and that's maybe most blatant when it comes to the curved antenna stripe at the bottom of the handset's back. The phone's left edge is mostly unadorned, concealing only the P10 Plus's SIM tray. 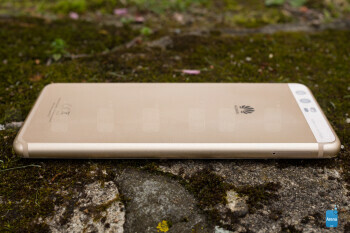 The bottom is probably the busiest side, with the phone's headphone jack, USB Type-C port, and main speaker. Along the right we find the power button and volume rocker, and up top there's an IR emitter – which we'll talk about more later. Like the regular P10, Huawei gives the power button on the P10 Plus a nice, but still very subtle color accent, anodizing the metal button with a sliver of a red beveled edge. It's just a little touch, but one that adds a bit more class to an otherwise plain-looking design. 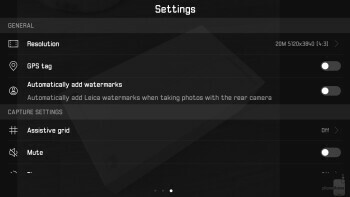 Around back, the P10 Plus shows off its dual Leica-branded cameras – and maybe most impressively, squeezes those in without any external camera bump. The handset's rear is also its spot to showcase the phone's color, and like the P10, the P10 Plus is available in a nice mix of options. There is one fewer selection available than on the smaller phone, with no “Prestige” gold option for the P10 Plus – just the “Dazzling” gold you see here. While many of those choices are just about the phone's color, a select few also deliver an additional texture to the phone's rear surface. Like the blue P10 we looked at before, this gold handset is covered by an intricate micro-array of tiny grooves, catching the light and giving the phone a unique feel in your hand. We love the look, though we can't help but wonder if it will end up trapping dirt over time, and just how durable it might be – it wouldn't take more than a few scratches for that beautiful pattern to start looking real ragged. The size of the P10 Plus isn't bad for a handset with a 5.5-inch screen – or at least it wouldn't have been just a few months ago. But now we're in the era of phones like the Galaxy S8, with more screen area than the P10 Plus, and a body that's smaller all the way around. 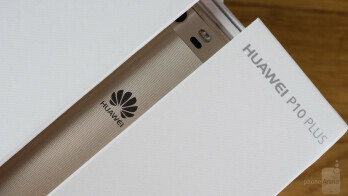 It's not that Huawei did anything wrong there, but the game is changing, and phones that are slow to catch up run the risk of feeling old-fashioned. Maybe more concerning is the build quality. When giving our P10 Plus a firm tap on the phone's back, we often feel the handset reverberating, as if there's a loose spring inside. Now, a little rattle from a phone's camera (and its non-stationary lenses) – that we understand (and there's very much that present here, too). But this is way more pronounced than on any other phones we have sitting around, and has us concerned with how well the P10 Plus is put together. The most obvious difference between the P10 and the P10 Plus is the latter's larger, higher-res display. 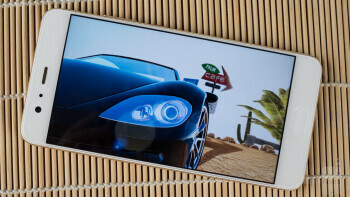 Instead of the 5.1-inch 1080p panel on the former, this phone is packing a 5.5-inch screen in a 1440 x 2560 resolution. While that spells a significantly higher pixel density, the screen on the P10 Plus exhibits some less-than-great color accuracy. 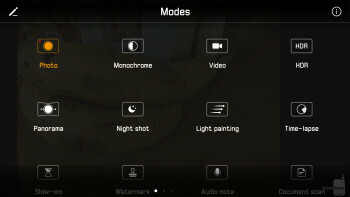 Huawei does offer the flexibility of a settings screen that allows users to tweak settings like color temperature, but that does little to compensate for the general over-saturation. And really, we'd prefer a screen that just worked as it should right out of the box. Maybe the greater problem is how the display feels. Now, this isn't usually a factor we take into much consideration when evaluating a smartphone, and that we're mentioning it here at all should signal to you that something's very wrong. Like some of its other phones, Huawei ships the P10 Plus with a pre-installed screen protector. 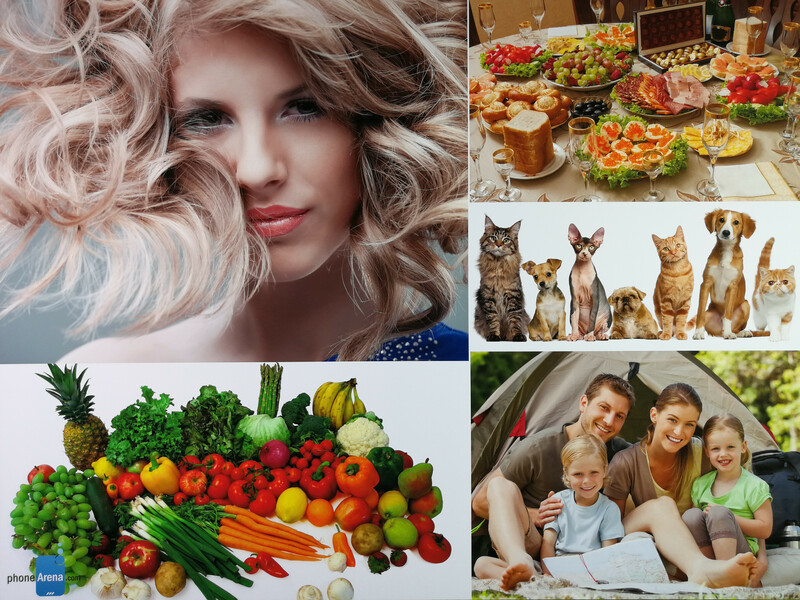 On its own, that isn't necessarily a problem – even if some shoppers might prefer to make the decision to install such an accessory on their own. And if you're used to screen protectors, this one might not feel much different from those you've already encountered. But we still can't deny that in using the phone we were bothered by the screen protector's sharp edges, and worse: the plastic-y feel of the surface itself. It would be nice if you could just peel this off and start fresh, but as many other reviewers have noted, if you do so you'll discover that the glass underneath hasn't been coated with the sort of oleophobic layer we've come to expect from smartphone screens – and for you non-engineers, that means that it's just a magnet for skin oil, quickly transforming into a smudgy mess. In the end you're forced to choose between this and a less-than-ideal screen protector; we elected to stick with the protector in place. Scandal's a funny thing for smartphones. Sometimes a phone bounces right off a controversy without batting an eye – just look at how all the antennagates and bendgates failed to derail iPhone sales. Other times the impact is much more substantial, and it didn't take very long last year for us to go right from the first reports of Galaxy Note 7 battery issues to the phone being recalled en masse and ultimately scrapped. The interface of the P10 Plus gives you just what you'd get from the P10. That is: Android 7.0 with EMUI 5.1 on top. Much of our same complaints carry over to this phone, including the unimpressive, somewhat dated-looking appearance of the phone's icon packs. We can appreciate what Huawei's trying to do by giving users a themed UI that's supposed to match the handset's exterior coloring, but the default, monotone look that results in isn't particularly attractive. 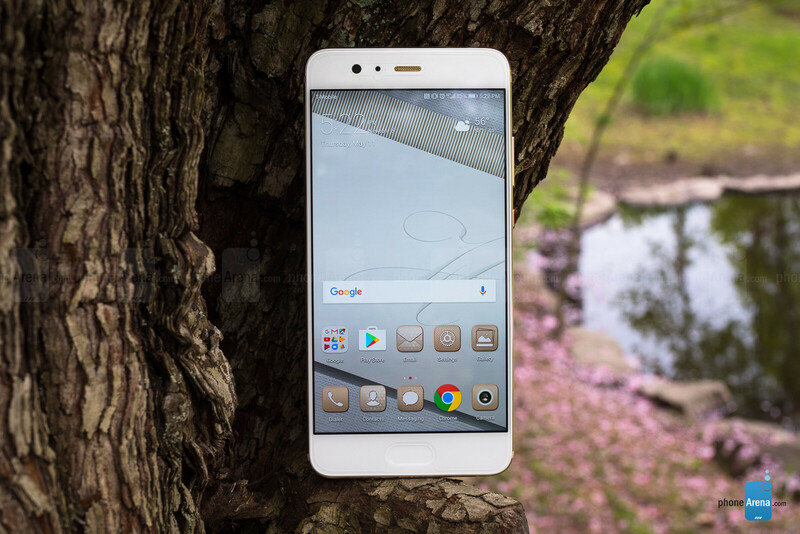 Luckily, EMUI offers a ton of options for customization, and it's easy to change things like the appearance of fonts, screen layout, app drawer settings, and numerous other tweaks that let you get the P10 Plus running just the way you'd like it. The P10 Plus uses a front-mounted fingerprint scanner, and like the scanner on the Moto G5, this one supports a number of tap and swipe inputs that can replace on-screen Android buttons. 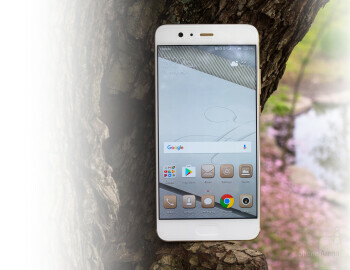 While we were initially a little apprehensive of Huawei's implementation, it is something that you tend to come around to after a bit of practice, and like so many other features of this interface, it's totally up to you whether you want to use it or not. We previously mentioned the phone's IR emitter, adding a bit of extra functionality lacking from the smaller P10 – why there wasn't room for such a compact feature on that phone, we can't say, but if you care at all about controlling legacy devices around your home, the P10 Plus has you covered. The P10 Plus runs Huawei's own Kirin 960 processor, just as the P10 itself does. While that isn't quite up to the performance level of next-gen 10nm chips like we see in the Galaxy S8, it does appear to be slightly more capable than the Snapdragon 821 we see on recent handsets like the LG G6 or HTC U Ultra. 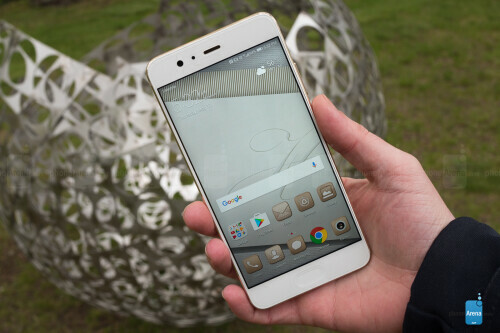 Of special note for the P10 Plus, Huawei offers the phone in not just a 4GB RAM configuration, like the P10, but also has a 6GB version of the hardware – and that's what we tested here. Honestly, that extra RAM is probably overkill, but much like storage, we'd rather have too much than too little. 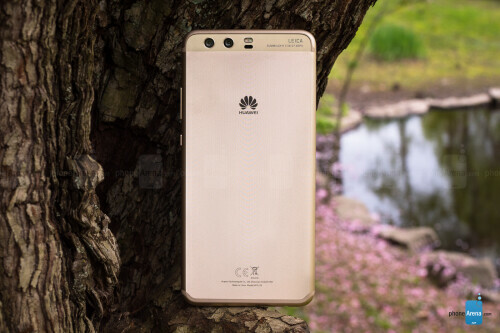 On both the RAM and storage fronts, it looks like we didn't end up with a bad combination of those components Huawei has been caught putting in P10 phones. Instead, our benchmarks suggest that, at least for storage, we've got the highest-end UFS 2.1 flash chip. 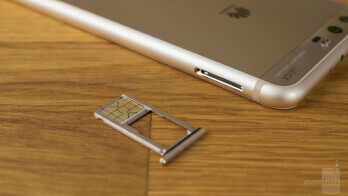 That's great for us, sure, but despite Huawei's insistence that the varying parts has little impact on performance as end-users will notice, we really, really hate the idea of going out to buy a phone like this and having no way to know (before taking the handset home) which combination of chips we're going to end up with. So many phones are on a relatively even playing field when it comes to connectivity these days, that a handset only really stands out it when it does something new and innovative or fails to live up to the standards set by every other phone. The P10 Plus is certainly solidly equipped on the wireless front, supporting well over a dozen LTE bands, as well as expected protocols like Bluetooth 4.2. But while wireless connectivity may present no problems, we ran into a few hiccups when trying to connect the P10 Plus to a computer over its USB interface. The Type-C port is only USB 2.0 – that's unfortunate, but this is far from the only phone that continues to marry the modern Type-C port with aging USB 2.0 communications. The more annoying problem was getting a PC to recognize the phone, and while a modern Windows 10 machine installed the correct drivers and was able to connect after a few moments, we struggled to access the phone's files through a Windows 7 PC. That's probably not a huge issue for most prospective P10 Plus buyers, but it did cause us to raise an eyebrow, all the same. 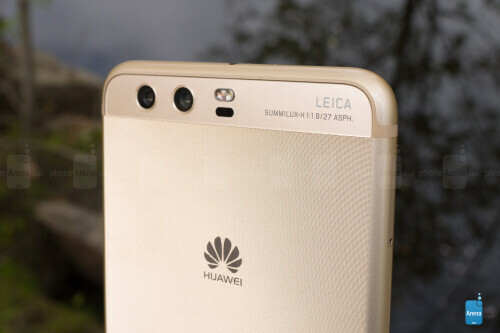 As we discussed in our review of the Huawei P10, these phones are equipped with some pretty respectable camera hardware. The combination of a very high-res sensor that's only equipped to detect luminance levels and a lower-res full-color sensor is a smart one, and their combined output allows the phone to produce images that include lots of detail, even across varying lighting conditions. But while the P10 Plus does have very nearly the same camera setup as the P10, there's at least on important change, with a wider-aperture f/1.8 lens designed to let in slightly more light than the P10's f/2.2. Does that ultimately impact its imaging performance? Let's take a look. For the most part, the P10 Plus impresses in the same ways the P10 did. Not only is the camera hardware itself versatile, but a bevy of shooting modes and software options help stretch that hardware as far as it can go. Of particular note is the camera's monochrome mode, which taps into that dedicated camera sensor to produce some stunning B&W shots; if you can't get past the lack of color you're doing yourself a disservice, because there's tons of dramatic potential in this mode. For the most part, the P10 Plus takes good advantage of its extra-wide aperture, and rarely did we find our images hurting for light. On the flip side, though, on more than a few occasions we saw the camera seem to be overwhelmed by this new abundance of light, producing shots that looked far more washed-out than environmental conditions would have us expect. The P10 Plus is pretty clearly equipped with some hardware that should have no problem delivering some very nice-looking video. In practice, though, we ran into a few issues preventing the system from living up to its potential. None of them are too huge on their own, but they added up to create a situation that left us feeling a bit dissatisfied with the phone's video performance. For instance, the P10 Plus struggles to re-focus on foreground subjects when recording video. Keep your distance, and things are fine, but if someone new walks into the frame you might be in trouble. And while the presence of an stabilization mode is nice to see, it seems to exhibit some sort of minor “pulsing” artifact that makes it look like the camera is trying too hard to process the scene. We also had the occasional glitch where we'd film a video in our preferred landscape orientation, but the resultant file came out in a 90-degree-rotated portrait layout. That all said, when things are working well (and barring these sporadic upsets, they tended to) videos captured with the P10 Plus can look very nice, with well-compensated exposure even on overcast days. Just don't necessarily go in expecting a hiccup-free experience. 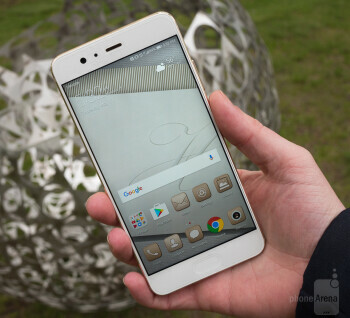 While the P10 Plus lacks stereo front-facing speakers, it very nearly makes up for that by pairing the phone's main bottom-edge speaker with output from the front earpiece. 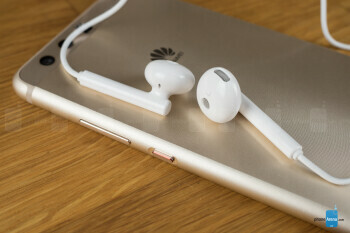 As we've noted so many other times when looking at other phones that pull this same routine, there's a real risk of imbalanced audio with schemes like this, and though there's no denying that the earpiece is much quieter than the primary speaker, the net effect of both running at once is still surprisingly satisfying. When you pair that kind of pleasing audio output with a big, high-res display like we find on the P10 Plus, you end up with a phone well-equipped for consuming all variety of media. 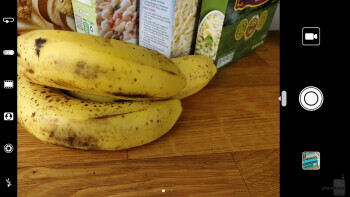 No big mistakes pop up with how the P10 Plus handles voice calls, and while the audio can be a bit washed-out and lifeless-sounding, at least it's clear; we had no issue hearing callers on the other end, nor did they report any problems understanding us. Huawei gives the P10 Plus a 3,750mAh battery, compared to the 3,200mAh component in the smaller P10. And while both phones run the same processor, the larger, higher-resolution screen on the P10 Plus ultimately takes its toll on battery life. In our custom tests, the P10 Plus managed to run for just over eight hours of screen-on time before depleting its power reserves. As we already established, the P10 runs out of juice in under eight. 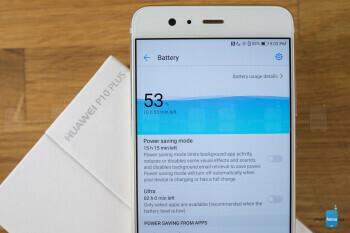 So while the P10 Plus has a significantly higher-capacity battery, the hardware's increased power demands ultimately translate into only a 25-minute extension of battery life. All things considered, though, that's not bad. 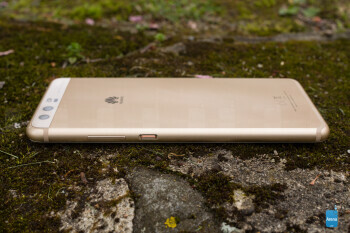 After all, Huawei only increased the size of the face of the phone with the P10 Plus, retaining the original's just-under-7mm thickness. And correspondingly, that limits just how large a battery the company's engineers could squeeze in. If the P10 Plus had arrived with worse battery life than its sibling, we'd be rightfully upset, but even parity wouldn't have been a disaster, and it's hard to get too upset about the meager gains we see instead. Recharge times understandably take a little longer on the P10 Plus than the P10, but the 112 minutes it took to restore the phone to 100% with its bundled fast charger isn't too shabby. The Huawei P10 Plus is a totally decent phone: it's got brisk performance, a camera that's more flexible than most, and a big, high-res screen. 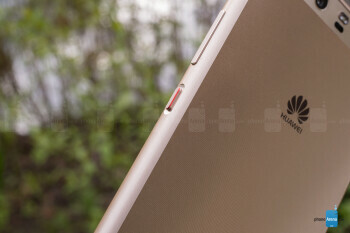 But at the same time, it's also a phone that's really difficult to feel very passionately for. Part of that has to do with the phone not really going above-and-beyond in any one way. 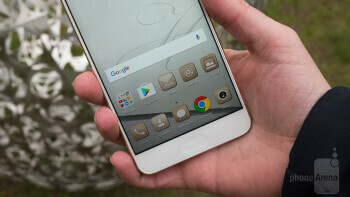 Like while its performance is good, we've already got faster phones. 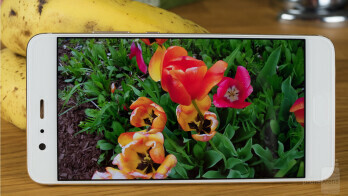 And though the camera doesn't make a ton of huge mistakes, this isn't going to be the first phone we look to when we need to snap a few shots. Then there's the specter of the memory and storage-speed scandal hanging over the phone, and while this is something we fundamentally know we should be upset about, we're finding it difficult to get overly bent out of shape about it – and not because it's less of a big deal than it could be (even though we did end up with some of the “good” chips in our review handset), but more because it fits in with the general good-not-great vibe that's been driving our experiences with the P10 Plus. That shouldn't be a huge criticism of the handset – and even on the “good” spectrum, we'd say this is up in “very good” territory. But it's not as well put together as the Galaxy S8, LG G6, or even the HTC U11. And especially with the wide array of colors Huawei is making the P10 series available in, that U11 comparison seems apt. Both phones sell for just about the same price, but in nearly every aspect of the phone's experience, the U11 comes out on top. The P10 Plus is thinner … but that's about it. 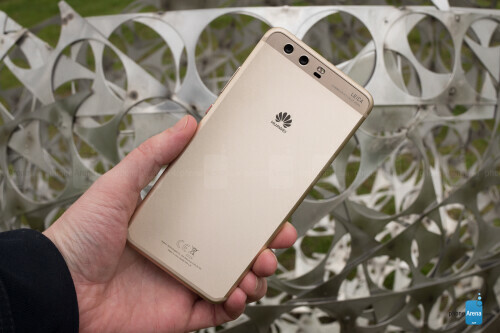 So while the Huawei P10 Plus isn't a bad phone, it is one that's facing some stiff competition. Just make sure you check out some of those peers before going all-in on the P10 Plus.